Clear Oak Designs opened its doors in 1976 and soon became known for innovative design with an emphasis on formulating unique and personalized designs to fit each clients vision and style. Included in this is the capacity to create special cabinetry designs and furniture details. We've spent the last 34 yearsrs providing expert home kitchen and bath design services. Always a maker of fine cabinetry, we have specialized in a Kitchen Remodel per our customers requests with Custom Kitchen Design as well as bathroom remodel and additions. We’ve spent the last quarter century providing expert home kitchen remodeling and design plus building services to Bay area homeowners. Obviously doing a Kitchen Remodel is our speciality. They not only design the space, they build the cabinetry specializing in Kitchen Cabinets for your new Kitchen Remodel; right down to custom finishes to complement any decor. 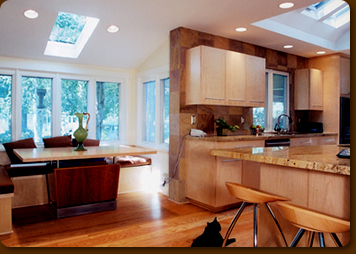 Whenever possible they use Green Home Remodeling methods and materials. No one beats our Kitchen Design and Kitchen Remodel ideas and finished kitchen as voted by our customers. Watch what one of our customers has to say.